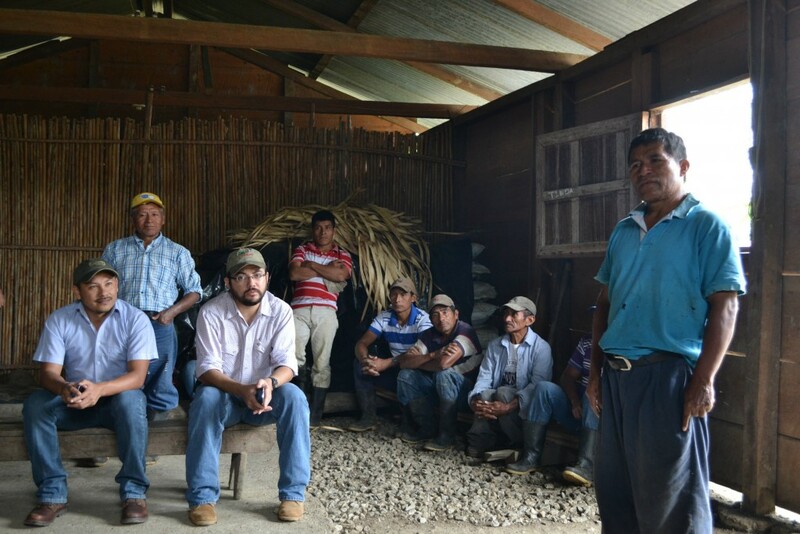 Erick Ac of IUCN and Roy Fraatz of Cacao Verapaz (seated to left), with producers from the ADIOESMAC association in Cahabón. ADIOESMAC (Asociación de Desarrollo Integral Ox’ Eek Santa María Cahabón) is a group of 42 farming families who share the labor and facilities to produce the beans behind our Guatemalan bar. We purchase these beans from ADIOSEMAC through Cacao Verapaz S.A. (CV), a social enterprise and export group that works with primarily indigenous Maya farmers in the Alta Verapaz department of northern Guatemala. CV is the second project established by the impact-driven cocoa sourcing enterprise Uncommon Cacao. Rather than handling cacao processing centrally, as similar companies do, CV offers technical support and trainings to existing farmer cooperatives who communally process their cacao and who then sell to CV for export. Cacao Verapaz has expanded their reach this year and is now partnering with ten small associations and four private estates all around the Cahabón, Lachuá, Petén, Polochic and Costa Sur regions of Guatemala. In 2015, Cacao Verapaz financed the construction of new drying decks for ADIOESMAC, but after receiving guidance from CV and a local non-governmental organization, FUNDASISTEMAS, the association has already outgrown their current processing space. They are now embarking on constructing new facilities to increase their overall capabilities through the support of a governmental agency, PRODENORTE. The construction is currently on hold thanks to paperwork and some political conflict, but they hope to have the new structures up and running by 2018. FUNDASISTEMAS will also be helping the association develop a clonal nursery — the success of which is dependent on the commitment of farmers to the association. 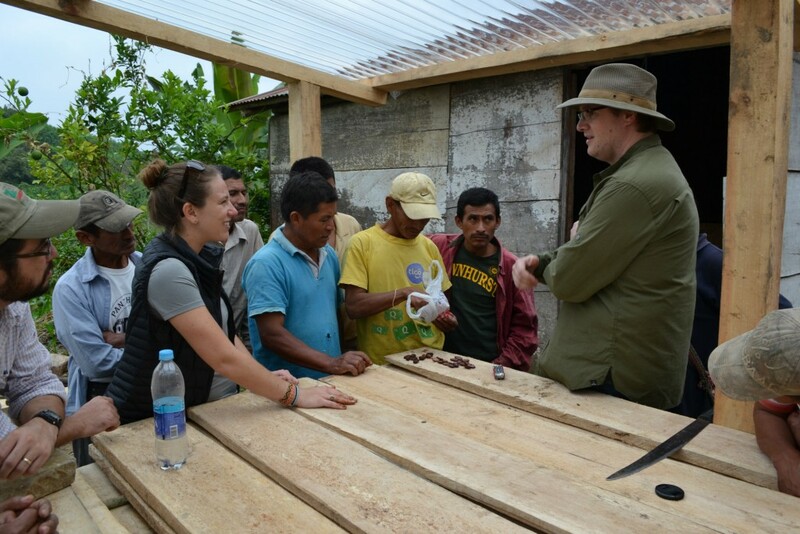 Emily Stone and Greg talking with producers at Cahabón’s new drying decks. Similar to ADIOESMAC, many Guatemalan community associations were originally formed as an attempt by the Guatemalan government to help alleviate poverty in the poorest regions of the country by creating opportunities for farmers. During President Lucas García’s administration, a number of UF-667 cacao seedlings were given to farmers who were encouraged to sell to the domestic market, with little to no emphasis on quality or transparency. Middlemen, commonly referred to as “coyotes,” bought their cacao at extremely low prices in order to turn it around and sell it for much more to other domestic buyers. At the time, there was no alternative market, allowing the coyotes to dictate the price. So, while this may mean fast cash for farmers, purchase frequency is not consistent or reliable, and the offered price fluctuates dramatically. Since inception, Cacao Verapaz has offered more equitable and stable payments directly to the farmers, established a standard of transparency, simultaneously connecting producers with a more diverse, international market of chocolate makers. Dandelion currently purchases as much as the association is able to produce, typically around 6 tonnes, which is a relatively small amount in the grand scheme of things. Unfortunately, the cooperative suffered from a shortage of cacao this year as a result of irregular weather patterns. This, coupled with the allure of fast cash from coyotes, meant we were only able to purchase 1.5 tonnes. This year we’ll be exploring ways we can be better partners to the cooperative as well as Cacao Verapaz going forward.